Bathroom Magnifying Mirrors are really useful accessories. In particular the simplehuman sensor mirrors are amazingly cool. Until you have used one, you can't imagine how much more detail you can see with the 5 x magnification and the LED illuminated surround. The mirrors all automatically light up as you approach them and switch off a few seconds after you move away, conserving the built in battery life. 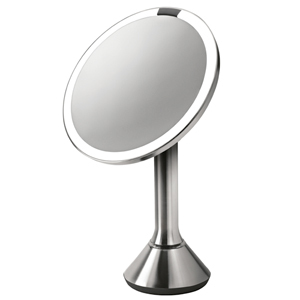 The mirrors have a sturdy stainless steel frame and look the part in your bedroom or bathroom. They only need to be charged once every 5 weeks or so, plus no trailing wires which is a real bonus. Plus we have lots of extending mirrors too, just like they have in hotels !